Printers are a useful bit of technology and as computers have advanced and become everyday objects, so have the printers that we use with them. Nearly everyone owns or uses a printer regularly, and if you have one then you’ll know how expensive they can be to run, not just that but the problems and errors can sometimes drive you to insanity. So to help you with your printer we’ve put together a short list of some printer tips and tricks. You may or may not have heard of drivers depending on how much you know about computers. A driver is basically a piece of software that operates and controls a device that is connected to your computer, in this case a printer. If you have lost the driver disk for your printer and need it to re-install the driver then don’t worry, most of the manufacturers have archives of their drivers on their websites, you will probably end up getting a newer version of the driver this way too. On some printers you can print out a test page without even going through your computers print interface. It varies depending on the model, for example on the Photosmart C3180 if you hold down the ‘x’ button and the colour button then a test page will print. Have a look through you printers manual and see if your printer has this feature. If you ever have any problems or errors when it comes to printing (in most cases everyone who owns a printer has had some sort of problem at some stage), then try rebooting both your printer and computer, check all the wires that connect your PC and printer and provide them with power are plugged in correctly and if all else fails then update/re-install your driver. Ink can sometimes dry up and cause small blockages within the print-heads nozzles, this can lead to your prints being streaky and faded. If this happens to you, you can buy cleaning cartridges that will clean the print-heads within a inkjet printer, they will break up and remove any ink that has dried inside the nozzles within the print-head. Web sites, emails and other documents often have ads and other clutter that you generally don’t want to print. PrintFriendly.com allows you to make any web page or document print friendly by getting rid of the unneeded clutter, saving you a lot of ink and money in the long run. There are also some installable alternatives, but personally I find using PrintFriendly.com the easiest/quickest way of getting rid of clutter. When buying a new printer, always check the ink cartridge prices before you buy. It is common to buy a printer that is extremely cheap only to find out that the ink costs more than the printer did. It is this razor and blade style business model that a lot of the printer manufacturers use to make their money (they sell the main product for very little and make up the money in the consumables), it’s a clever business model, but it drives the customers insane. If you can buy re-manufactured ink cartridges or can get them re-filled professionally then do so. Re-manufactued/re-filled/compatible cartridges do not void the printers warranty and as long as you check for reviews of the company you are buying from first then you should get similar or the same print quality for a lot less. If you have a laser jet printer, and your toner cartridge is beginning to show signs of running out (streaks and lighter print outs), take out your toner cartridge and shake it lightly, the same way you probably had when first inserting your cartridge. This should redistribute the toner dust that is left inside and will hopefully let you print out a few more pages before it totally runs out. If you are wanting to save money, then try changing to the print quality to ‘draft’ or ‘grey-scale’ in your printer settings to save ink and print double-sided (also called duplex printing) if your printer allows it, to save paper. If your ink cartridge dries up and as a result isn’t printing well then try dipping the print-head on the cartridge (this only applies to the cartridges that come with the print-head built-in) into some warm/hot water for a few seconds, this should break up the dried ink. After doing so dab the print-head on some tissue paper, if you get a solid line of ink then dry the cartridge off and place it back in the printer. If your printer tells you, you are running low on ink, but you still are getting good quality prints with no streaks or fading, then carry on printing as you will probably still get a few more pages from it. The estimation of how many pages your cartridge will print is just that, an estimation, more than often you will get more prints that it says. 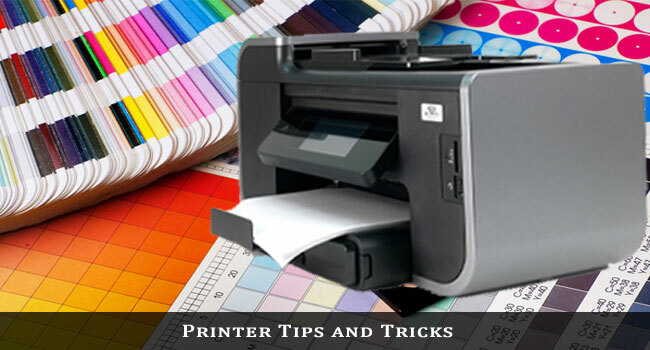 If you know any other printer tips and tricks then share with us in form of comment below. If you refill the cartidge & it is still not printing it might be that air has entered into the print nozzles & is stopping the ink flowing into them, what you need to do is draw ink out from the print head nozzles which will in effect re-prime them. You can do this with a syringe (without needle) & cling film to create an air tight seal, be careful not to touch the nozzles though. Once you have the air tight seal draw back on the syringe until the ink start flowing, in most cases the cartridge should work fine. Thank you for these tips! I just got a printer for my birthday and am having trouble setting it up. My dad always did the technical things so I never learned. Thanks again! awesome dear.. ur tips helps me to protect my printer and do lot of things without damaging. i love your writing thanks a lot. Really good tips to protect printer and keep them life longer. your Some of tips are very useful as we can use them regular basis. Keep it up boss and keep update. I know it might be a little off topic for this post, but I have found that the refill cartridges that people can use to refill ink at home, CAN help you save money, BUT do not ALWAYS work properly, and when they do decide to work properly, there is no specific rhyme or reason to it. Not one that I can figure out anyway. I’ve attempted refilling a good number of cartridges myself and usually I just end up with, at the least, ink on my hands that’s impossible to get out. But my point is, that I’ve never been able to find a single refill kit that was worth the money. Ink can be SO expensive. If one(an ink cartridge and refill) were to work well, it would be worth its weight damn near in gold. Do any of you know of any ink refill kits that work and if so, what type of cartridge do they work best in? Well Jesse you’re going to get your hands dirty if you try to refill ink on your own. Its better to go to a computer store and get it refilled from a professional. And every other kit you find on the net will make your hands dirty so there’s no way out. But you can try and check youtube for relevant videos to help you. If you didn’t find one reply here and I’ll tell you the right one. I will buy a printer next month. So your trick will help me then. Your post helped a lot. Thanks buddy! Hey, Well I did not know this much about printer. I got lots of things to learn from this post. Specially the point # 4. Its a complete guide. Re-filling cartridges is the best way to say money on printing cost. I’ve been a computer technician from the past 5 years and have saved a lot of clients money by telling them to refill cartridges instead of buying new one. In India for a ink-jet printer the budget cartridge costs $10 but refilling it only costs less than $2. In-case of laser-jet cartridge it costs about $35 but refilling it only cost $7. So you definitely save 80% of price. In a print communication services, would they provide something similar to what was mentioned in the article? At the moment, I’m trying to find services that can help my small business in printing out several test projects of ours as well as layouts. It’s something that keeps us busy to do and also our clients demand that from us. I like what you wrote here regarding how to unlock the full potential of your printer. My wife and I have never thought to check the cost of ink before buying a specific printer — that is a great idea. We are thinking about a multifunctional color printer, and will consider this information when buying one. Thanks again!